I recently read Roger Ebert's book on Martin Scorsese's films (Scorsese by Ebert), which led me on a quest to review Scorsese's filmography, including ones I've never seen (New York, New York, Kundun) and those I turned off before completion on a first viewing (Bringing Out the Dead). 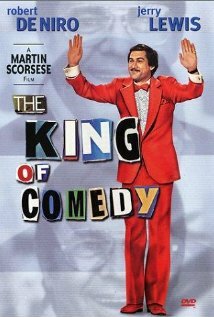 Today I watched the movie I consider Scorsese's most underrated, The King of Comedy. The biggest obstacle the movie has to overcome is expectations: people expect a comedy, when King is more in the Taxi Driver vein, a very disturbing portrait of insanity. Robert De Niro, in a performance that rivals any of his others, plays Rupert Pupkin, the self-declared "King of Comedy," who kidnaps Jerry Langford (Jerry Lewis), a Johnny Carson type of character, and extorts ten minutes of air time on Langford's late night program. One of the movie's surprises is that when we do finally get to hear Pupkin's comedy, it's not bad -- he has some talent. The not-so-buried message is that you can be talented and slip through the cracks, that it's not necessarily the best that rise to the top. This is emphasized even more by the ending of the movie, which if read literally and not as another Pupkin fantasy, sees Rupert become a bona fide star not because he's funny, but because he's the nut who took Langford hostage. Scorsese has a lot to say about the nature of celebrity, and those desiring fame might think twice about it after watching this movie (or even after watching just the scene where Jerry tries to walk a few blocks without being accosted by fans, one of whom wishes cancer on him when he refuses a ridiculous request). With the exception of Taxi Driver, it ranks alongside Scorsese's other masterpieces (Taxi Driver to me is a top ten all time movie and stands alone). In addition to De Niro's stunning performance, there's Sandra Bernhard's as another delusional fan, and she equals De Niro's intensity if not his brilliance. King is sadly overlooked in discussions of Scorsese's great films and that's something that I'm sure one day will be corrected, when it's seen for what it is rather than what it sounds like it will be. Dark comedy as Rupert prepares his audition tape. Didn't think of that connection, but it's definitely there.